The verdict: Sony’s $199 Bluetooth Noise Cancelling CH700N’s offer everything you could want out of a pair of wireless headphones. Their sound is fun and incredibly detailed, they’re light and comfy, and they cancel an okay amount of environmental noise. The better models offer luxury improvements, but you’re not missing anything critical by picking this pair. The build is a little bit bland for the price point, but these often go on sale for less than their retail price. They’re good for the normal price and a total steal at a discount. Want more detail? Scroll away! I usually like Sony’s headphone offerings. From their classic MDR-V6 to the modern 1000X lineup, they’ve been at it for a long time. Sometimes they push the boundaries of modern tech…and other times they cherry pick bits of products from their long history to create something with an undeniable pedigree that just does its job well. The CH700N is the latter. This is an iterative update through-and-through then, but on the plus side, you’re getting the benefits of everything Sony’s engineers have learned over several releases. The 700N’s are available in Black and Blue, and there’s also a Gray color that’s exclusive to Best Buy in the US. Also, they frequently go on sale, often for $149, and occasionally for $99. I managed to snag a pair for $99 in this past weekend’s fake Black Friday sale and I’m sure they’ll get another discount for the real one in a few weeks. They compete really well at their normal price, and at a discount they’re hard to beat. These sound a bit better to my personal tastes and more detailed than the Cloud Mix headset I recently reviewed…when powered on. You can technically use the 700N’s passively with a 3.5mm cable. But they sound muddy, indistinct, and almost bad. Flick the power on, and a whole huge pile of DSP correction kicks in, vaulting these into the top tier of sound. Bass is rumbly, thumpy, and clean, and highs are airy and detailed, with a volume just south of the fatigue point. The mids are a tiny bit cold and sucked-out, but not to the point of sounding bad. In their powered wireless and wired modes these have a slightly v-shaped signature then, but it’s a good one of those. It reminds me a little bit of the excellent DT770, and the detailed character of the upper midrange is quite similar to the Audio-Technica MSR7. I like the way they sound much better than the Cloud Mix, which has a warmer, gentler character that might be more to your tastes if you don’t love cold treble detail. Yes I did. They have a signature that’s very close to accepted “neutral” targets, and their midrange is a bit more prominent than the Sony’s. I think they’ll appeal to a wide audience. However, I think the Sony’s are also within the range of that neutral target when powered on. They just have a character and quality that I personally greatly prefer. The downside is that you’ll always have to remember to keep these charged…though that’s not too hard. They have a quick charge function that’ll get you an hour of playback in wireless mode with 10 minutes of charging, and a fully charged battery lasts 35 hours in wireless and 50 hours wired. Both of those numbers are with noise cancelling turned on, too! Soundstage is quite wide for a closed-back pair, making these just as nice for movie watching and gaming as for music listening. Again, you might hate the slight coldness of the midrange. You might hate the need for power to fix the audio issues of these. In those cases, the Cloud Mix might serve you better. It has the same sound even with the power off. As do some other wireless headphones on the market. But if you don’t mind turning on a thing and you like detailed/crisp sound, Sony has you covered. They’re one of my favorite-sounding headphones I’ve used in the last year, and they hit my personal preferred curve right on the nose. And oh, if you don’t like the default tuning, the Sony app lets you EQ them to your heart’s content. Sony’s Headphones Connect App is fully compatible with the 700N’s, and the changes you make will be permanently stored to the Bluetooth mode. That means if you switch to a computer or other Bluetooth device that’s not your phone, you can keep your settings. Those settings don’t apply to the wired mode, unfortunately, unlike last year’s XB950N1. Inside the app, there’s a full graphic equalizer with many presets and multiple custom slots. You also get access to Sony’s Clear Bass feature, the same stupidly fun DSP-powered bass boost used on their Extra Bass models. You can also turn on some virtual surround modes…but I don’t love any of them. They try and push your stereo music data into a fake virtual room, and the results are a little strange-sounding. They also lower the overall volume output of the headphones. Finally, at the bottom of the app you can turn the noise cancelling on or off, turn DSEE on or off, and switch the noise cancellation button to controlling Google Assistant instead. I enjoy the way it sounds, but purists might hate it. It artificially pushes out high frequency detail just a touch, and enhances soundstage width as well. Let me start this by addressing the proverbial elephant, and saying that these don’t cancel noise nearly as well as the Bose QC35 or the 1000X series from Sony. If you’re looking for the best performance, run to one of those models and stop reading about these. Sony’s “AI-driven” digital noise cancelling software is still totally fine. It counters the background noise in your environment with minimal pressure on your ears or white noise in your music. It turned my local noisy coffee shop into a pleasant listening environment, reducing its loud din to a gentle background. I can’t ask for much more than that out of a $200 product. The AI that Sony touts is a slight misnomer. Basically, when you first turn on the headphones, they’ll take a quick peek at your audio environment with their built-in microphones and select one of three preset noise cancelling profiles depending on the noise that’s present. If you want to, you can hold down the NC button on the headphones and re-perform this measurement. I guess it’s AI-driven in that it’s happening without any user-input, but this isn’t some magical computer thinking, just some basic audio processing. Like all noise cancelling systems, it works best on constant droning noises and is less effective against sudden transient noise. The system lacks the glasses/hair compensation of the 1000X’s Sense Engine, and lacks the constant NC adaptation and ambient awareness systems from those headphones as well. This is just solid, basic noise cancelling. If you’ve never heard one of the more expensive systems, you’ll probably be impressed by it. 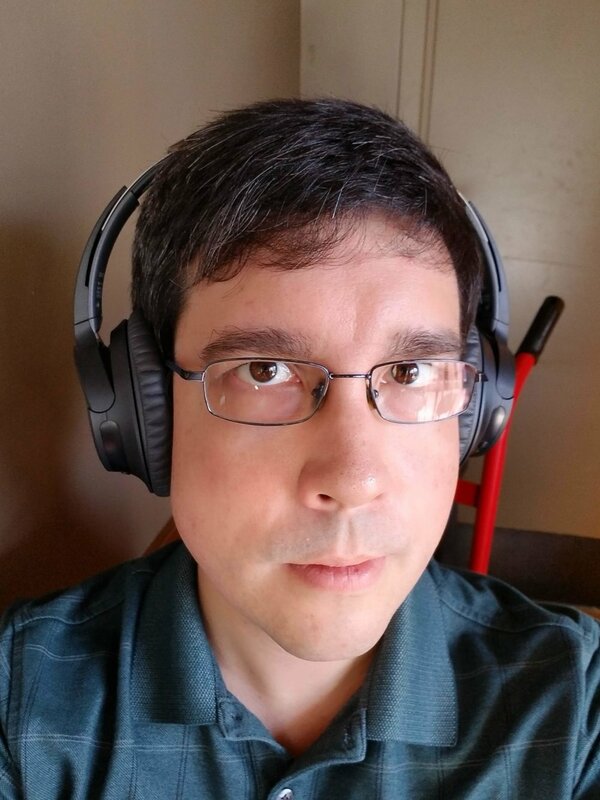 Even though I’ve owned headphones that do a better job cancelling out the background, the combination of audio quality and background reduction here is really hard to beat for the price. 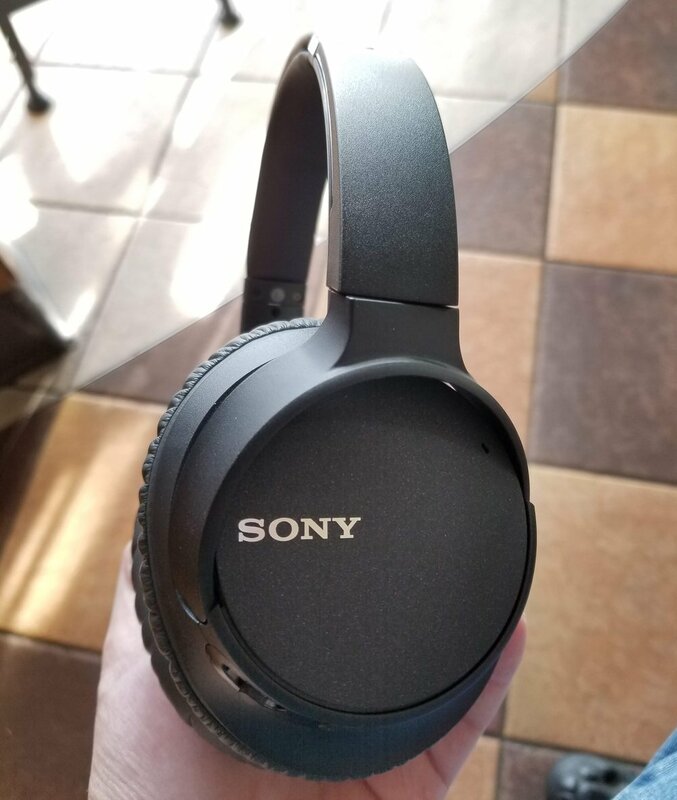 Sony is one of the only companies that consistently nails headphone comfort. Although the headband on the 700N looks like it won’t be comfy at all thanks to barely having any padding, the light weight makes up for it. The ear cups are nice and deep, with angled drivers that stay out of the way of my ears and padding that’s made of a dense memory foam. The 700N’s are immediately comfy and they stay that way over time. They heat up a little bit, but the almost vinyl-like material on the pads is easier to wipe sweat off of than the leatherette on some other pads. The 3.5mm input is slightly forward, a nice design touch that allows the cable to fall in front of your shoulder. The NC button, unfortunately, is in a stupid place. There’s a reason that Sony keeps putting this design out over and over again: it’s classic. The ear cups are nicely shaped, and they don’t stick out too far from your head when you wear them. The headphones rotate flat for easy storage inside a bag or on a desk. They have a look that just gently says “headphones” without screaming at the people around you. The Sony logos on the sides are the iconic shiny script that’s been around for a couple of decades now, and that’s the one frill. The build of these isn’t outright bad or cheap, but it’s a little lacking for a $200 product. The headband is a solid metal piece, but most of the rest of the headphones are made of a textured plastic. It does its job of being lightweight for portable use while not feeling like paper, but nothing about the build is all that impressive. My pair doesn’t have any squeaks or creaks to it, so that’s something. $200 is where I start to expect slightly nicer material choices. The headband here lives up to those standards, as does the foam inside the ear pads…but everything else feels like it’s one step lower than it should be. Maybe the electronics inside made profit margins a little tight, who can say? The textured plastic is a slight upgrade from the old ZX770’s, and it feels about as nice as Sony’s other current headphones in this price range. It’s just not very exciting. Some rubberized surfaces would go a long way towards improving things here, and enclosing the slots on the sides of the adjustment arms would help too. The volume controls are practically on the bottom of the right ear cup, a slightly bizarre choice. The volume and NC buttons are located in weird spots on the headphones. It’s pretty easy to press the power and track skip buttons, but the rest of the buttons are a bit hard to access when I’m wearing the headphones. The NC button is on the front of the left ear cup. If you want me to press a button while I’m wearing headphones, it probably shouldn’t be on the front. Similarly, the volume controls are low enough on the right side that it’s easy for my thumb to just slip right off while using them. Neither of these things are a deal-breaker, and Sony has crammed a lot of controls into a tight space. But it takes a lot of adjustment to find some pretty important buttons and use them without feeling awkward. The previous ZX770 model of these came with a simple carrying bag. Heck, Sony’s much cheaper studio models come with a carrying bag. Sony should have included a carrying bag with these, even just a simple cloth model would do. Sony quotes a range of 33 feet for Bluetooth on this model, and it’s right on the money. I got dropouts the second I hit that distance. That used to be pretty average for a Bluetooth headset, but now it’s a bit short. Your mileage will of course vary depending on your environment, but I found the range of the signal a little lacking here. Sony’s WH-CH700N’s provide exceptional sound quality, comfort, and technology for the price. As long as you don’t mind using these powered, you’ll be treated to a wonderful sound signature in a lightweight frame with just enough noise cancelling to make a dent in ambient distractions. The isolation performance won’t be enough for those who demand the best, and audiophiles might not enjoy the slightly cold nature of the midrange. But I completely love the the way they sound. They have emphasis in just the places I like, and I don’t mind all the digital tricks they have to pull to get there. Sony focused on exactly the right things that a headphone needs: Sound quality and comfort. In this price range, they’re a great pick. And on sale? They should top your list.